The media in Iraq has been accused of exacerbating the sectarian tensions that already exist between Sunnis and Shia groups. Both factions own and operate many of the newspapers and radio and TV stations in Iraq, converting the media in their propaganda tool to spread their message and alienate the two Muslim societies. Some critics have pointed the negative role that media is playing in the sectarian confrontation. 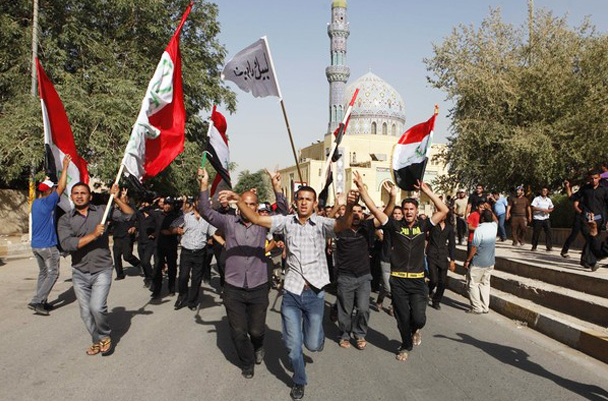 There has been an increase of Sunni and Shia attacks across the country and especially in Baghdad in the last months. Salah Nasrawi writes in Al-Ahram newspaper that “the Iraqi media and journalists are being caught in the crossfire of the country’s sectarian divisions and driven by warlords and self-centred politicians who are inflaming sectarianism for their own greedy interests”. Overall, the Iraqi media are split into three camps – Shia, Sunni and Kurdish, each of which leans towards its own community instead of reporting on inclusive terms. Shias accuse Sunni-owned radio and television of taking sides by presenting rumours or sectarian rhetoric and giving platforms for speakers and preachers to incite hatred. On the other side, Sunnis denounce that the Iraqi Media Network IMN, a national institution funded by the public’s taxes, is a tool of the Shiite Prime Minister al-Maliki and its failure to cover on going protests in the Sunni provinces, reports Osama Al-Habahbeh on his article at International Media Support. The current situation in Iraq brings back memories from the bloody years of sectarian confrontation between 2005 and 2008, when on average 3.000 people were killed every month and the media was used to demonise the other communities. It is usually said that media can foment the conflict but also contribute the solution. In this case, the media in Iraq is being used for the former as the journalist Salah states in his article. “Iraq’s media now reflects the country’s political and religious divisions rather than being a diverse and free media and a means to inform, educate and entertain people and act as an essential instrument of nation-building”.